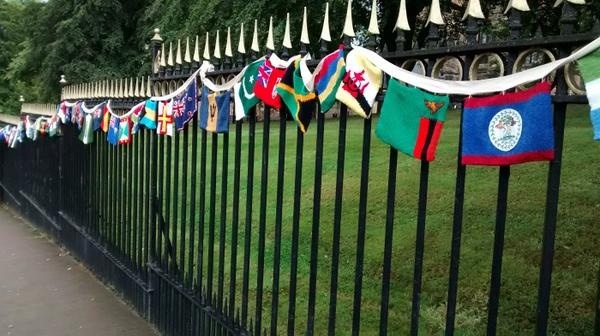 Despite the highly changeable weather, we had a great day at the Commonwealth Games Cycling Road races today, and the crowds of people who gathered to watch the race loved the hand-knitted flags! Thanks so much to the Glasgow Uni historians and friends who were pressed into flag-hanging and photography duties. But mainly thanks to all of our wonderful knitters. We will post more photos soon, but here’s one to start.